From Holton I continued along the road to Blyford: all of the churches were very close together in this area, and it felt good not to have to drive more than than 15 minutes from Westleton all day. 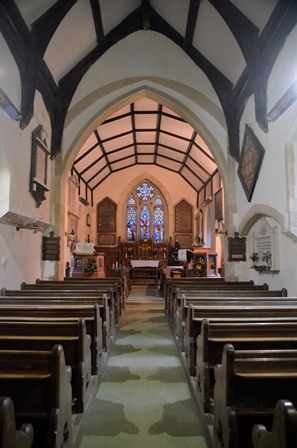 I found the church opposite a pub – as it should be, I always think – on a little green at a junction with the main road. It must have been a main road (by rural standards at least) as it was signposted in one direction to Halesworth, and in the other, to Blythburgh. 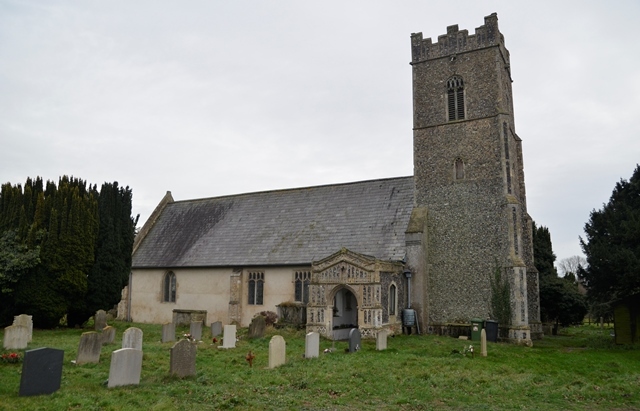 But I was very aware that my unfamiliarity with this area of Suffolk made it feel remote, no matter how much traffic might be passing, or how many people might be visiting the pub. On a Wednesday mid afternoon in December, however, neither the road nor the pub were frantically busy, and mine was the only car parked on the green. 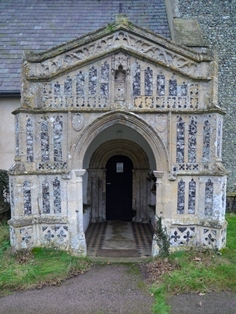 Blyford church possessed an elaborate Norman doorway within an impressive flint porch, and a clear-windowed interior. It was bright inside, despite the fact it was getting towards sunset on a dull day: I can only imagine how lovely it would be on a sunny day. 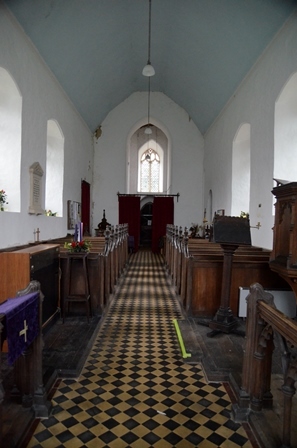 The Victorian choice of tiled floor was not to my liking, but as I could find no fault with the rest of the church, I forgave them their bad taste. 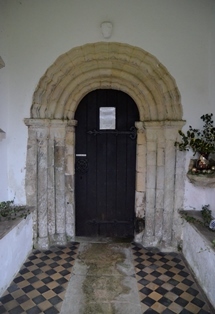 There were no particularly striking features aside from the Norman doorways, but those provided sufficient interest, and with four church visits in a day, it might become overwhelming if they were all dazzling experiences of history and architecture. 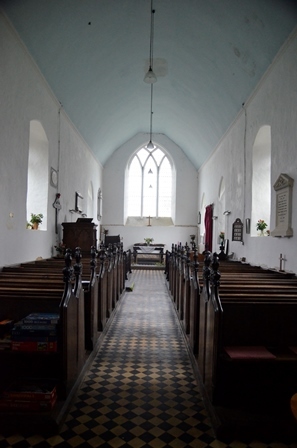 Instead, as at Holton, I felt the privilege of the acoustic and a period of quiet practice here. Before leaving, I noticed some graffiti on the porch doorway: one was obviously a scratch dial, and there were some of the usual symbols, such as overlapping, upside-down pairs of Vs. But the graffiti that interested me most on this occasion were two that looked very much like flowers. I’m not sure how likely it is that they were – I have never seen or heard mention of such engravings – but why not? Flowers seem as good a symbol as any to engrave on a church. It was getting dark, but I found Thorington church open and equipped with electric lights, so it didn’t matter: I could take my time. The only thing I needed to remember to do first was take photos. I was pleased to have made it to a fourth church today, and I was thrilled that I had found all of them open, especially after my less successful experience the previous afternoon. Thorington had a secretive feel to it: located on a small lane and partially hidden behind tall trees, the darkness was exacerbated. But this wasn’t enough to make it feel gloomy. 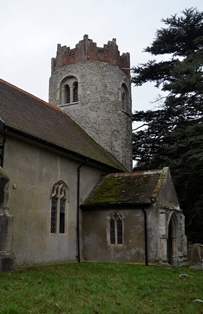 For one thing, its tower was quite remarkable (photo below). I have read that it is late Saxon. I have a tendency to forget this was more than a whole millennium ago: those thousand years seem to disappear when you are looking at such a structure. For some reason it has occurred to me to convert this time into days: approximately 365,000. Perhaps bizarrely, this calculation makes me realise quite how short a time frame this is, in the context of the earth and the universe. And how short a human life really is. 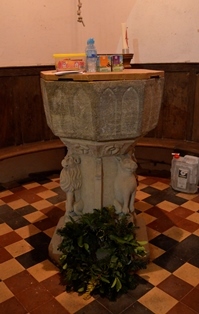 Inside, I walked up to the chancel and turned around. 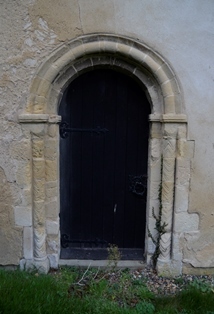 I was delighted with what I saw: a Norman tower arch, and another smaller doorway, or window perhaps, above it. At least that’s what I thought I saw from a distance. When I moved closer, I could see the Norman arch was in fact a modern imitation. Then I didn’t like it at all. 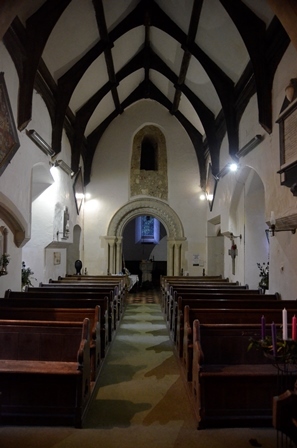 On this occasion, however, I don’t think this was simply a matter of prejudice against Victorians: I have seen half-decent Victorian imitations of Norman arches, such as at Whepstead. This one looked plastic. I don’t mean literally, but somehow the words ‘artificial’ and ‘fake’ aren’t sufficient to describe the impression it gave, so pristine and exaggerated were its decorative features. 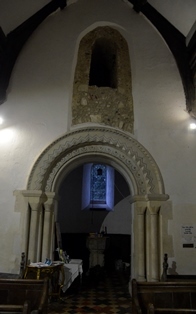 So I looked above it and admired the smaller, original arch instead. After looking around, I set up to play. 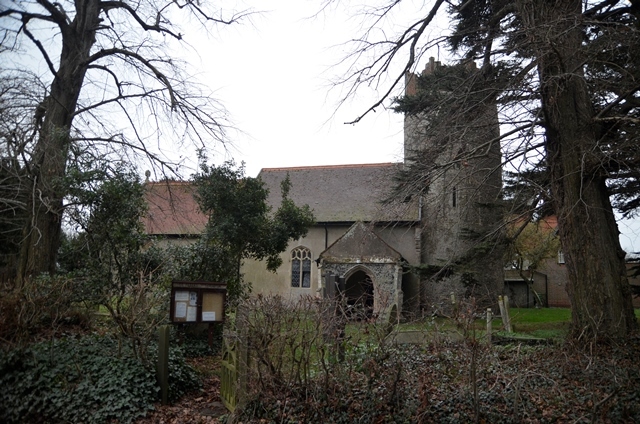 Thorington’s acoustic was as good as all three other churches I had visited today. I spent most of my practice time on the fourth Bach suite in E flat major: I had made an early new year’s resolution to learn and perform this suite in 2019. I knew it from childhood, but I had never performed it in a concert. The reason I hadn’t resurrected it sooner was simply a question of stamina: the key and the character of the piece mean it is a very hard play. Now I am better in practice than I ever have been, and have tackled pieces requiring just as much stamina as this one in the last year, it no longer feels like too extreme a challenge – especially if there is no deadline for learning it. I can simply choose to perform it when I am ready. I enjoyed my practice so much I didn’t want to leave. By the time I felt able to tear myself away, two thoughts were whirling around in my head. ‘God I love playing the cello. God I love E flat major’. The former was a relatively new development: I haven’t always loved playing the cello for its own sake. Rather, I have enjoyed it simply as a medium for making music with other people. The latter was a long-standing love, but recently semi-forgotten. I am aware of sounding like a geek to non-musicians, but it can’t be helped. Much as I like all of the other Bach suites I have played this year (4 out of 6), I realised that even the most emotional movements don’t touch me in the same way as the whole of this suite does, by virtue of being in the key of E flat major. My dad and I had an understanding about this key. We only had to mention the fact of a piece of music being in E flat major to know what the other meant, although we never really tried to put it into words. It particularly applied to Mozart: The Magic Flute, at least two piano concertos, a string trio, quartet and quintet, to mention just a few. Now I did feel the urge to put it into words, and I was interested to know whether anyone else had had similar thoughts and feelings about different tonalities. So it occurred to me to search online. The first and most common interpretation that came up was that E flat major was a ‘bold and heroic’ key. That’s wrong, I thought, irritated. Completely wrong. You can’t just decide this because the Eroica symphony (Beethoven) and ‘Jupiter’ from The Planets (Holst) are in this key: two pieces in the whole of the history of music can’t define its character. Regal it certainly may be in some cases, but this is not the same as heroic. For me it is the divine key, though I am not religious. Heart-felt, soul-felt, happy and sad at the same time. ‘Thank you’, I thought, feeling huge gratitude to Herr Schubart of the early 19th century. ‘That’s exactly it’. If I were to go back to Honington to play for the praying man, it would have to be this suite in E flat major. 1. www.wmich.edu/mus-theo/courses/keys.html from Christian Schubart’s Ideen zu einer Aesthetik der Tonkunst (1806). Translated by Rita Steblin in A History of Key Characteristics in the 18th and Early 19th Centuries. UMI Research Press (1983).